Robots are changing the face of manufacturing. They are designed to move materials, as well as perform a variety of programmed tasks in manufacturing and production settings. They are often used to perform duties that are dangerous, or unsuitable for human workers, such as repetitious work that causes boredom and could lead to injuries because of the inattentiveness of the worker. Industrial robots are able to significantly improve product quality. Applications are performed with precision and superior repeatability on every job. This level of reliability can be difficult to accomplish any other way. Robots are regularly being upgraded, but some of the most precise robots used today have a repeatability of +/-0.02mm. Robots also increase workplace safety. 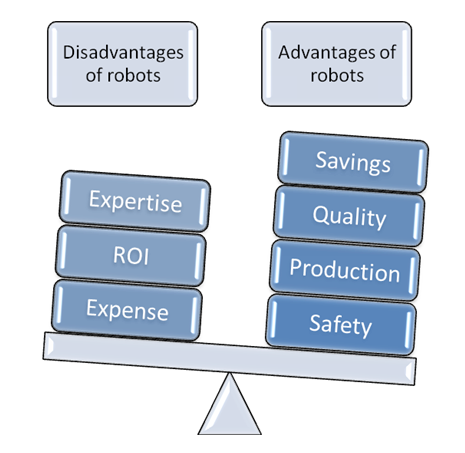 The disadvantages to integrating robots into a business are the significant upfront cost. Also, ongoing maintenance requirements can add to the overall cost. Yet, the long term ROI makes manufacturing robots the perfect investment. Material handling is the most prevalent application of industrial robots with 38% of the robots being used for this purpose. 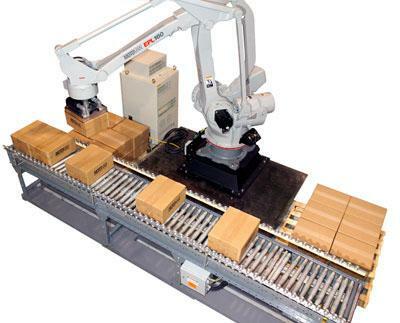 Material handling robots can automate some of the most tedious, mind-numbing, and unsafe tasks in a production line. The term material handling takes in a variety of product movements on the manufacturing floor, such as part selection, transferring of the part, packing, palletizing, loading and unloading and machine feeding. With the introduction of collaborative robots into manufacturing with a low price—around $20,000—the potential to revolutionize production lines is growing. 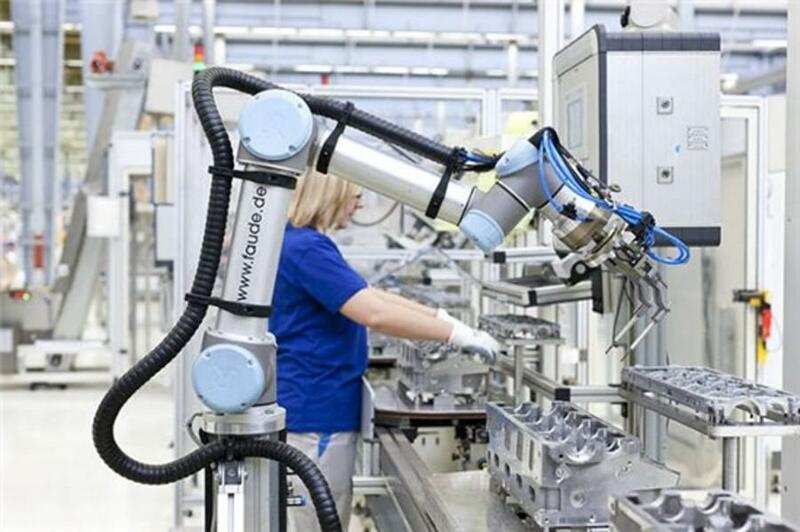 A lighter, mobile plug and play generation of cobots is arriving on the production floor to work safely alongside human workers thanks to advances in sensor and vision technology, and computing power. Should an employee get in their way, the robot will stop, thereby avoiding an accident. 29% of the robots used in manufacturing are welders. This segment mostly includes spot welding and arc welding. 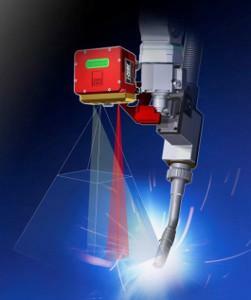 More small manufacturers are introducing welding robots into their fabrication line. The cost of welding robots is going down, making it easier to automate a welding process. The robot may be directed by a predetermined program, be guided by machine vision, or follow a combination of the two methods. The benefits of robotic welding have demonstrated to make it a technology that helps many manufacturers increase precision, repeatability, and output. 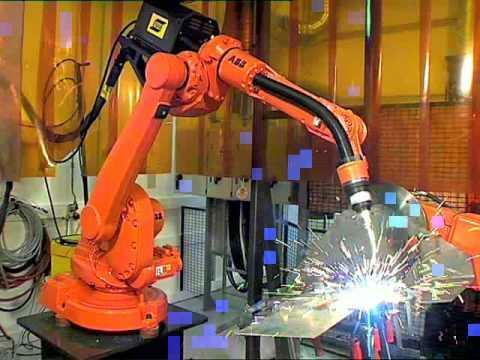 Welding robots offer efficiency, reach, speed, load capacity, and enhanced performance for welding parts of all shapes and sizes; and they support a wide range of intelligent functions such as ready-to-use robotic vision, and collision avoidance. Assembly operations encompass 10% of the robots used in manufacturing, including fixing, press-fitting, inserting, and disassembling. This category of robotic applications has diminished because of the introduction of different technologies such as force torque sensors and tactile sensors that gives more sensations to the robot. When it comes to putting parts together, assembly robots move faster and with greater precision than a human, and an off-the-shelf tool can be installed quicker than with special-purpose equipment. 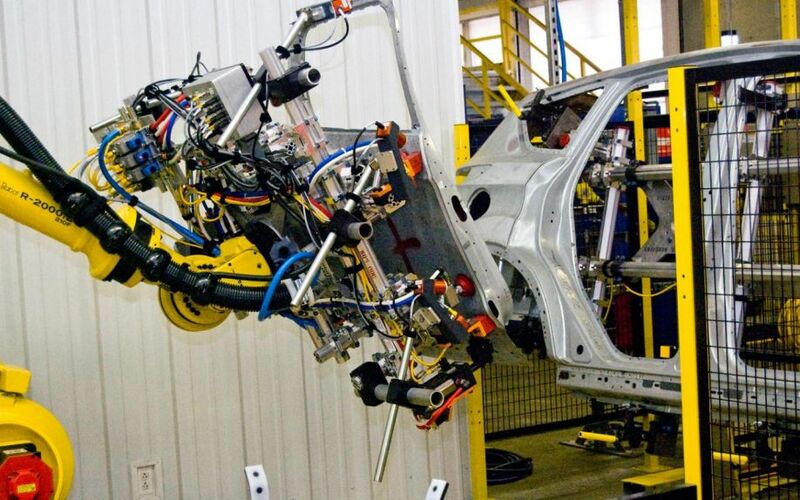 An assembly robot is easily reconfigured and it is a low-risk investment that satisfies the demands of manufacturing, quality and finance all at the same time. Assembly robots can be fitted with vision systems and force sensing. The vision system guides the robot to pick up a component from a conveyor, reducing or eliminating the need for precise location of the part; and visual serving allows a robot to rotate or move a piece to make it fit with another piece. Force sensing helps with part assembly operations like insertion, giving the robot controller feedback on how well the parts are fitting together or how much force is being applied. Together, these sensing technologies are making assembly robots even more cost efficient. 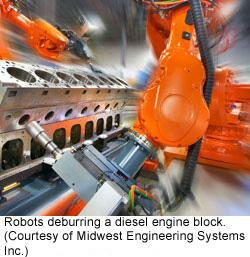 Dispensing robots are used for painting, gluing, applying adhesive, and spraying. Only 4% of the operational robots are doing dispensing. Dispensing robots offer greater control over the placement of fluids, including arcs, beads, circles and repeated timed dots. The benefits of a dispensing robot include reduced manufacturing time, consistent accuracy over rough and uneven surfaces, and improved product quality. Dispensing robots are available for 1-part and 2-part materials. 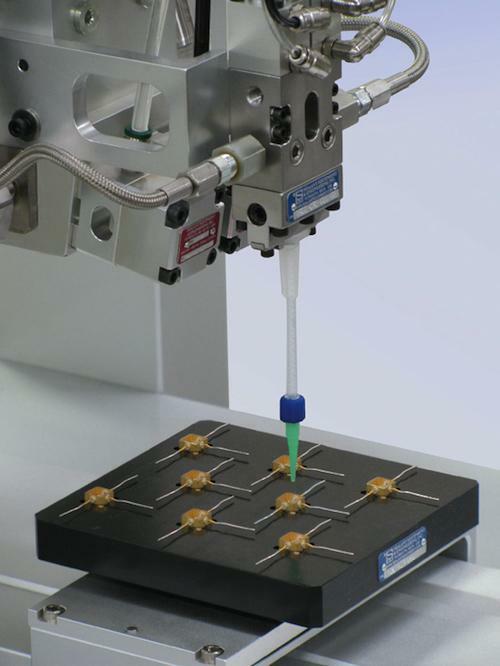 The XYZ gantry robot system applies adhesives, sealants and lubricants with precision placement directly onto parts with repeatable accuracy. They are used for high payload, high-speed applications. These robots can be used to form in-place gaskets, apply adhesives, and spray coatings. The primary components of an automated dispensing system are the PC, the robot, and the dispensing valve components. The robot implements a computer program to dispense fluid from the valve in a specific pattern onto a workpiece. The fluid is dispensed through valve system, which may be contact or non-contact. Contact dispensing requires that the dispensing tip be placed close to the part. On systems that include a CCD camera, the robot can automatically adjust the dispensing program for each workpiece, allowing for variations in the workpiece position or orientation. To accomplish this, the software compares the current workpiece location to within 0.098 in. 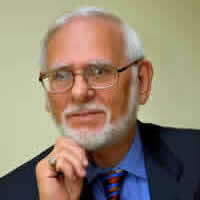 of a reference location that is stored as an image file in the program. If the robot detects a difference in the X and Y positions and/or the angle of rotation of the workpiece, it adjusts the dispensing path to correct for the difference. Many manufacturers finish their products through grinding, cutting, deburring, sanding, polishing or routing. Material removal robots can refine product surfaces, using harsh, abrasive methods to smooth out steel to precise spot removal for small parts like jewelry. Robot material removal can not only perfect a company's product, but it will increase cycle times and production rates, which will save money. By automating material removal processes, manufacturers increase the safety level in their shops by protecting workers from harmful dust and fumes caused by material removal applications. Robot-based inspection systems are on the increase, as vision systems become increasingly powerful and flexible, allowing for flaw detection on parts, guaranteeing correct part assembly. The vision system finds and inspects a part accurately. Most importantly, integrators have to make sure of getting very good positional accuracy and communicating that back to the robot quickly. Robot inspection systems are now measuring components, but as tolerances get tighter and tighter, these tolerances become harder to satisfy. The robot moves from verifying a part’s presence to actually measuring it. Manufacturing robots are more affordable today than ever before. Standard robot models are now mass-produced, making them more available to meet the ever-increasing demand. These robots are more straightforward, and more conducive to plug and play installation. They are designed to communicate more easily with one another, making for easier production assembly because the resulting systems are more reliable and flexible. Manufacturing robots can handle more, as they are constructed to offer complexity and toughness in diverse manufacturing settings. Robots are the future of manufacturing.